While Yemen is known as the historical home of coffee, Ethiopia has a long tradition of use of this delectable bean both as a food source and for beverages. Many Ethiopian coffee farmers work extremely small plots of land (in some cases fewer than five acres) and several offer organic coffee beans. The washing and drying of the coffee beans on these small coffee farms must be done on-site, due to few transportation options. When you purchase Ethiopian coffee, you might be contributing directly to the well-being of a coffee farming family smallholding. In this guide, we will cover everything from the history and types of coffee from Ethiopia and buying considerations in our Ethiopian coffee reviews. The majority of the coffee beans grown in Ethiopia are Arabica beans rather than Robusta beans. American coffee fans have built their palates around the Arabica bean, so Ethiopian coffee production has a happy and welcoming audience for their hearty, fruity bean. Roasting will subdue some flavors and bring others out, but coffee fans agree that there is nothing understated about Ethiopian coffee. The bean from a coffee tree is a fruit, and the process of washing and drying Ethiopian coffee beans keeps that fruity flavor front and center. It's still possible to find coffee bean trees growing in the wild in the Yirgacheffe and Harrar regions. The coffee beans from this area around the city of Irgachefe are of medium body and have a bright citrus taste. Ethiopian Yirgacheffe coffee is generally grown in small plots by family farmers. Many of these garden plots are fewer than five acres. The beans are generally processed by washing away the papery hull and drying them in the sun. This coffee is quite labor intensive; many farmers in the region specialize in organic farming methods and are buoyed by free trade organizations. Ethiopian Harrar coffee is grown to the northeast of the Yirgacheffe region and at a slightly lower elevation. This coffee is nearly always sun-dried before shipment and offers a natural mocha flavor. Harrar has less of a citrus flavor than that of Yirgacheffe coffees, though some drinkers find a hint of blueberry in this milder bean. Where is coffee grown in Ethiopia? The Ethiopian Coffee Regions are spread across the southern half of the country and include both mountainous growing regions (similar to Kona coffee) and "garden" regions, or those growing at a slightly lower altitude. Many Ethiopian coffee farms started when farmers harvested beans from the wild trees, then began to transplant or start coffee trees under the forest canopy. As previously stated, Ethiopian coffee is grown on very small plots. Per Courtney Columbus with NPR, climate change is heavily impacting the coffee growing region of Ethiopia, primarily due to disruptions in rain patterns. As coffee crops fail, or at least fail to thrive, these individual farmers must make the difficult choice to move from coffee to another cultivated crop. As coffee is grown as a shade plant, changing the crop means adding to the deforestation crisis in Africa. The Volcanica Yirgacheffe is harvested from the wild trees noted above. The Yirgacheffe region produces coffee grown at between 5800 and 7600 feet in elevation and delivers a hearty and heavy coffee with strong fruity overtones. This is not a delicate roast but often has a cinnamony undertone. Be prepared for a bracing cup of joe. The ordering process of buying coffee from Volcanica confirms that you'll get the most authentic flavor from your purchase. This hearty bean is prepared simply. You'll enjoy a medium roasted bean that's not roasted until you order for maximum freshness. Simply grind and enjoy! Fans of dark roast coffee will love this bean from CoffeeBeanDirect. 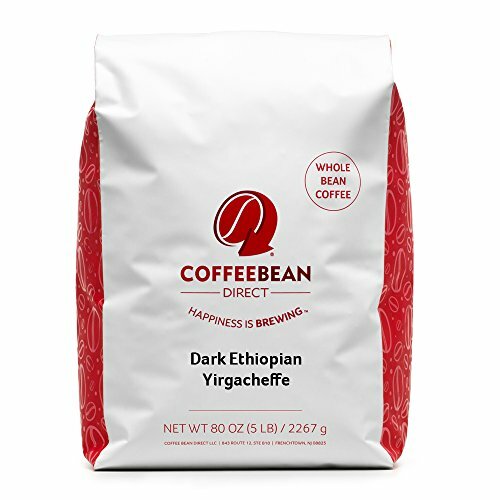 Their Dark Ethiopian Yirgacheffe is a true dark roast, prepared slowly for maximum freshness and flavor. Purchasers should note that this a large bag of beans and is not resealable. To keep your beans airtight, you'll need to move them to another container. Because these beans are slow roasted, you might find they are quite oily. Unless you are hooked on dry roasted beans, this should not be a problem. This hearty and heavy coffee delivers a full punch of dark roast coffee for your senses. The aroma from the bag alone will lift your spirits, and the freshly brewed coffee will elevate your mind. This Fair Trade coffee offers Yirgacheffe fans the chance to contribute directly to the small landholders growing their coffee. These beans are organically grown and gently roasted in an environmentally friendly facility. The FTO Yirgacheffe is roasted to a level of darkness known as a city roast. It finishes roasting between light and medium, providing a citrus finish with a hint of tangerine. Instructions for storing these coffee beans are carefully noted on the side of the bag. Don't expose them to light, heat, air or moisture. Transfer your beans to an airtight container, don't freeze them, then grind, brew and enjoy! Out of the Grey coffee offers a single origin bean from the Harrar region on the eastern edge of Ethiopia's coffee belt. This Harrar coffee is 100% organic and is packaged in 12-ounce bags, ideal for a small household that expects the freshest beans. This Ethiopian Harrar will be roasted a little darker than medium and loaded with rich coffee flavor with strong floral and citrusy notes. However, this coffee is not so darkly roasted that it will be bitter. You can buy this coffee at any grind you prefer, or simply buy the beans and grind them yourself. The bag is easily resealable, but you'll do a better job of protecting the bean by either stashing the bag in an airtight container or by transferring the beans. RhoadsRoast Coffees roasts on a daily basis and ships their coffee in the afternoon. This Ethiopian Queen City Harrar is a 2.5-pound bag of coffee beans, roasted a bit darker than a medium roast for a full floral flavor. Harrar beans, like most Ethiopian coffee beans, are washed and sun-dried on site. This gentle curing process leaves the true berry flavor in place before commercial roasting, resulting in an extremely flavorful coffee. 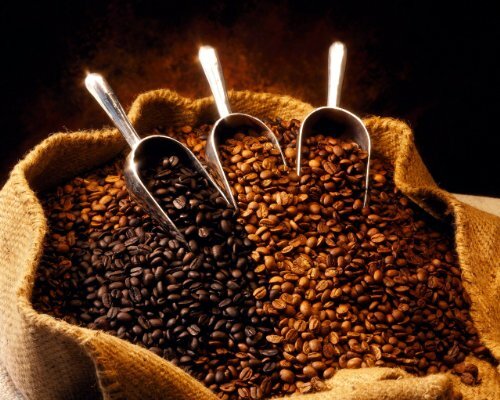 RhoadsRoast offers coffee fans many options in their coffee processing. If you're interested in using a home coffee roaster, it should be noted that this company will ship you green, unroasted beans to roast at home. The Ethiopian Queen City Harrar is roasted at City + for bracing flavor. Ethiopian coffee flavor is hearty and complex, but there's nothing subtle about it. If you're a fan of mild or delicate flavor, you may struggle to find an Ethiopian bean that suits your taste. If we had to choose just one from those reviewed, Volcanica Ethiopian Yirgacheffe would be our first pick. Volcanica is a brand we are familiar with and the strong coffee offered could be tamed down with water or your favorite condiments. 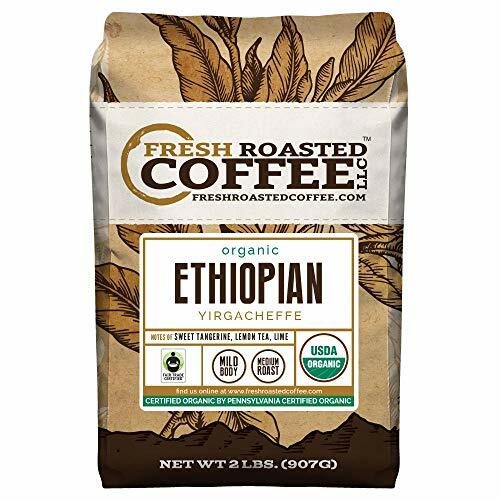 If you like a cup of coffee that will wake your brain and your taste buds, Ethiopian coffee purchases are a great option to support small farmers and enjoy wonderful, well-flavored coffee. Did you enjoy this guide? Let us know in the comment section with your favorite Ethiopian coffee and tips for preparing it.